This past week had a few stories from the Department of Defense and the defense against the dark arts of social media. We are using this blog as an approach to engage the public in Department of Defense (DoD) considerations of web 2.0 capabilities, and are excited to participate in this new facet to the President’s openness and transparency efforts.-Read more on the Forum. In what seemed like only a few hours later, Wired reported that DOD was considering banning social networking sites like Twitter and Facebook because they cause security "headaches." [T]his fresh ban stems from fears that Facebook and the like make it far too easy for hackers and cybercrooks to gain access to the military’s networks. “The mechanisms for social networking were never designed for security and filtering. They make it way too easy for people with bad intentions to push malicious code to unsuspecting users. It’s just a fact of life,” says a source at Stratcom, which is responsible for securing the military’s “global information grid.”--Read the rest in Wired's DangerRoom. On Monday, the Marines announced an IMMEDIATE BAN OF INTERNET SOCIAL NETWORKING SITES (SNS) ON MARINE CORPS ENTERPRISE NETWORK (MCEN) NIPRNET. The U.S. Marine Corps on Monday issued a directive banning access to Internet social networking sites on the Marine Corps Enterprise Network because such sites represent a security risk. Marine administrative message 458/09 says that social networking sites like Facebook, MySpace, and Twitter "are a proven haven for malicious actors and content and are particularly high risk due to information exposure, user generated content and targeting by adversaries." Social networking sites create vulnerabilities that can be exploited and may expose unnecessary information to adversaries, putting military personnel at increased risk of compromise, the directive says.--Read more on InformationWeek. "What's going on?," you may ask. Hasn't DOD been at the forefront of social media engagement? The questions being asked by some worried brass and the edicts and bans being handed down are a reflection of the reality that there is a conflict between legitimate security issues and the reality of this very open, very participatory new world. But, I would like to offer a Grimm Fairy Tale. 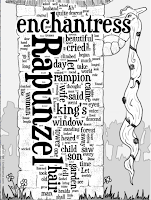 "Rapunzel, Rapunzel let down your hair." And with that quick phrase, the prince was inside the fortress and "married" the fair maiden. Bottom line, while you can set up multiple, extraordinary, and high-hurdle defenses, the desires and needs to extend beyond the "impregnable" fortresses may make them insufficient. Better said by Talking Salmons. Social media is how I communicate...It is the evolution of communication. Faster, fitter, more productive, free, easy and beneficial. Policy makers who ban social media because of the threat of viruses make no sense to me. Are we still in the era of burning towns to stop the plague? Do we ban cars when a teenager drives drunk? Do we ban computers when someone writes a computer virus?--Read the entire excellent post on Talking Salmons. I am sounding a bit redundant, but, once again, this is stuff that we are figuring out. 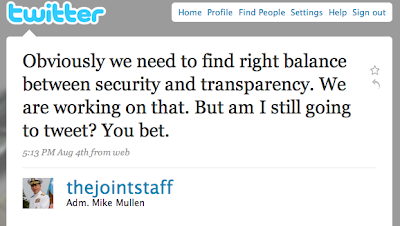 So, I would like to leave this post in the able tweet of Admiral Mike Mullen, chair of the Joint Chiefs.